Join me for a Wild Atlantic Way workshop. It takes place on Saturday, June 22nd. We usually meet up at Westport, or wherever you are staying about 1pm. 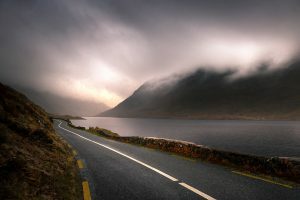 Then we will drive out to chosen locations to photograph the Mayo landscape & coastline – mostly around the Delphi/Doolough area. I will drive us all so it’s not necessary to have a car for the entire day. Together, the group will visit well-known locations as well as some lesser-known ones. We will be stopping at 4/6 different places or more if time allows. All locations are within 10-15 minutes drive from each other. Later on, we plan to be down on the coast in plenty of time to hopefully catch a sunset and some wave/ocean action. The workshop will conclude shortly after sunset which is at 10.10pm this day. I will cover all aspects of landscape photography including shooting in manual mode, using filters, composition and a little long exposure if people want it. It’s not necessary to have filters as I have spare ones on the day. I will tell you all I know about capturing the scene around us and teach you the aesthetics of photography as well as the technical side. The cost is €120 per person. I may request a deposit of €60 a month beforehand to secure your place on the workshop. The remainder can be paid on the day. The workshop is limited to 3 people. Class size is small by design to allow for plenty of one-on-one instruction opportunities. It will be an ideal opportunity for you or your camera club friends to bring your landscape photography to the next level. The workshop fee includes all transportation during the workshop. Not included is transport costs to/from the workshop start/finish point or any food/drink. Bottled water is provided. I will have my MacBook and Lightroom on hand to show you how to quickly edit a photo to make it pop. We’ll even do it on one of yours. I cannot guarantee fine weather – in fact, sometimes we may not want it to be fine. This is the West of Ireland after all, so big cloudy skies are always welcome. All you need to bring is an open mind and a blank canvas.